A 92-year-old cancer survivor becomes the oldest woman to complete a marathon after crossing the finish line of the Rock 'n' Roll Marathon in San Diego. 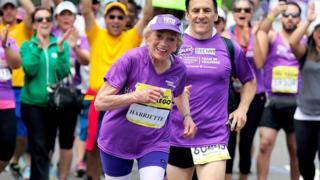 Harriette Thompson crossed the finish line on Sunday at 92 years and 65 days old to beat the previous record held by Gladys Burrill, who was 92 years and 19 days old when she completed the 2010 Honolulu Marathon. Ms Thompson from Charlotte, North Carolina was participating in the San Diego marathon for the 16th time and finished just 17 minutes off her time from last year. Inspired by this story? For more information on how to get into mass participation running click here.